Try your hand at pharmacy biz. 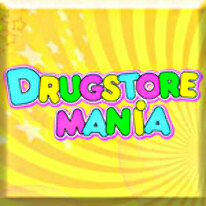 Try your hand at pharmacy biz in Drugstore Mania! Liz, a hard-working and talented pharmacist, opens a drug-store in a small town. She is concerned not only with quick and deft client service, but also with high-quality one. In Drugstore Mania, you and Liz will do your best to bring people health and good mood. Sell potions, prepare herbal tinctures and make up complex prescriptions. As you progress, open drugstores in larger towns and boroughs until you hit the big time!